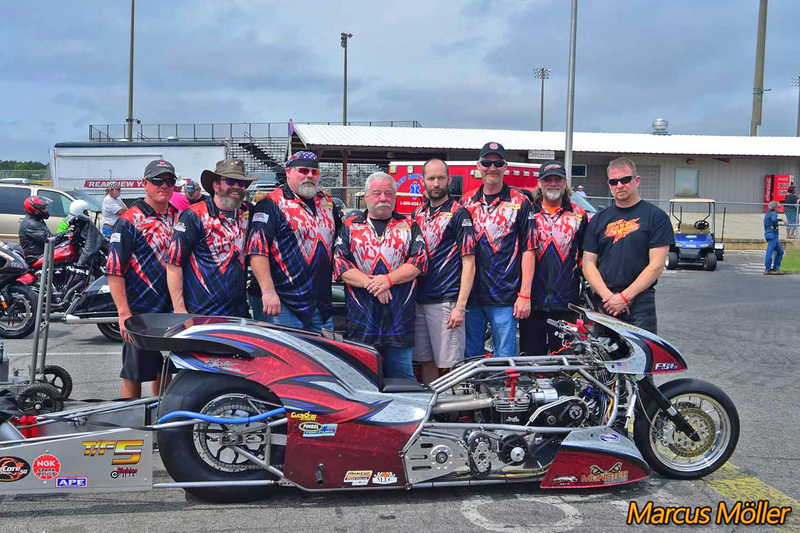 The Brown/Bradley Top Fuel Motorcycle had another successful outing at the Manufacturer’s Cup season opener this past weekend at South Georgia Motorsports Park in Adel, GA. 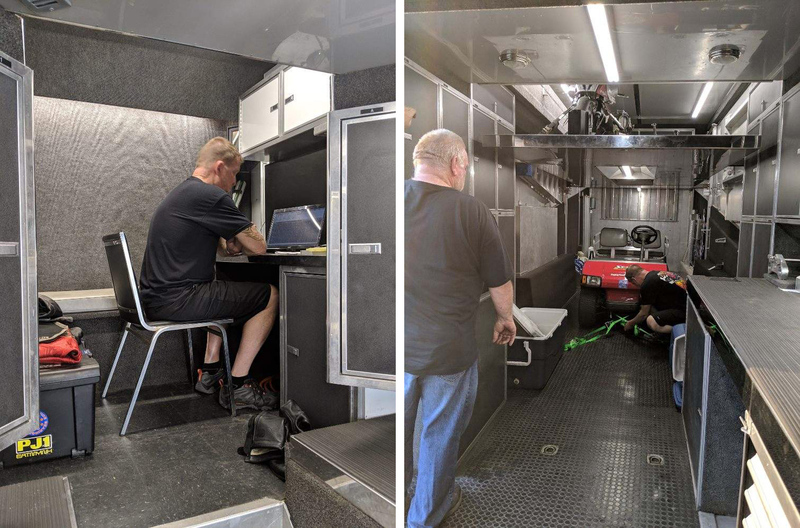 The team arrived at SGMP on Thursday for some last minute work on the bike and organization of the new trailer. With Friday’s rain forecast at 80% the team elected to make the test run on Thursday to verify all systems were functioning correctly. Thursday’s run to about 400’ yielded a 1.09 60’ and 2.79 330’ incremental times. Solid for the new team. The bike performed flawlessly except for the new blower belt coming apart and also taking out the Mag/Pump belt. Both belts were replaced, and the bike was ready for qualifying. After on and off data recording problems and a complete inspection from Racepak of the system over the winter, we still had significant data problems with no data that was usable. Friday’s forecast was wrong as most weather forecasts are and we had good weather all day. The first round of qualifying was scheduled for 5 pm, but a brief rain shower came in about 4:45 and ended the day. Saturday was great weather all day and allowed for all three rounds of qualifying. 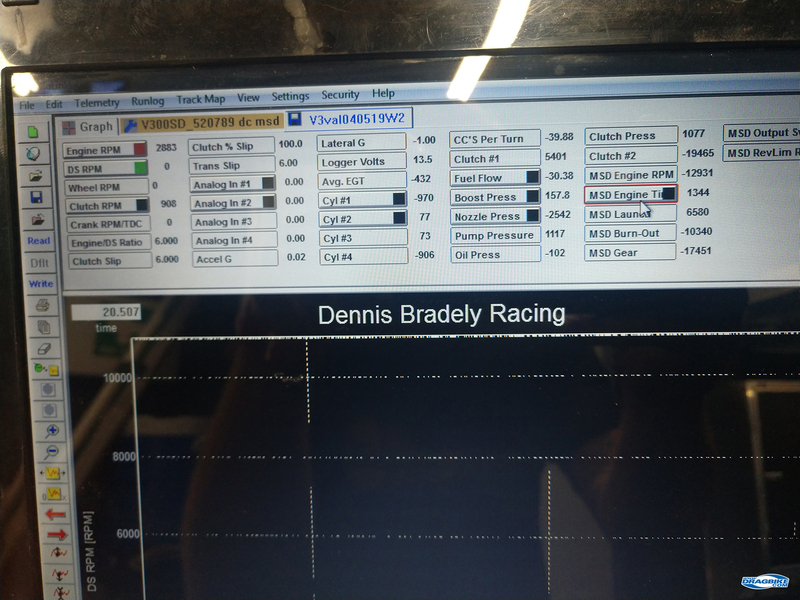 Q1 was similar to the previous test run with a 1.09 60’ but shucked the new drive belt off this time which ended the run. 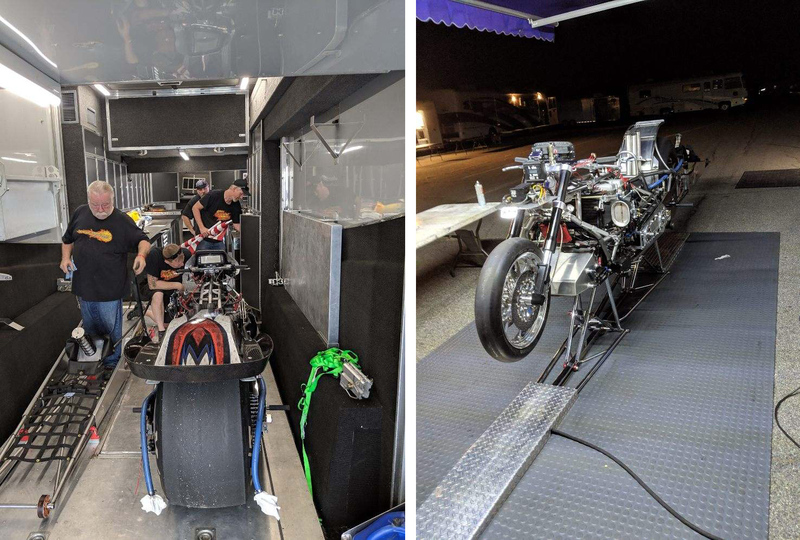 Qualifying round two was a good solid run to about 900’ but the engine had weakened and our short times slowed to 1.12/2.852 with a coasting 6.42 @188 mph. Our first engine showed 75% leakage out the exhaust on the #1 cylinder, so we replaced it with our second engine before Q3. The last qualifying pass was similar to Q2, a little slower short times with a 6.386 @212.93 mph on a less than ¼ mile run. With no good data to know what is going on we again hurt the #1 cylinder, this time with 60% leakage and a missing spark plug porcelain. We reran the engine Saturday night hoping it would seal itself up, even though we knew the valve or seat may have been nicked by the porcelain. The engine was now leaking 75%. Sunday race day provided another beautiful day; unfortunately, our first round opponent Sverre Dahl from Norway had damaged his engine and could not compete. We elected to break the beam and move to the next round to prevent further damage to the engine. Dave Vantine and team had struggled all weekend with a fuel system issue but finally fixed it and laid down a solid shut-off run in the first round. 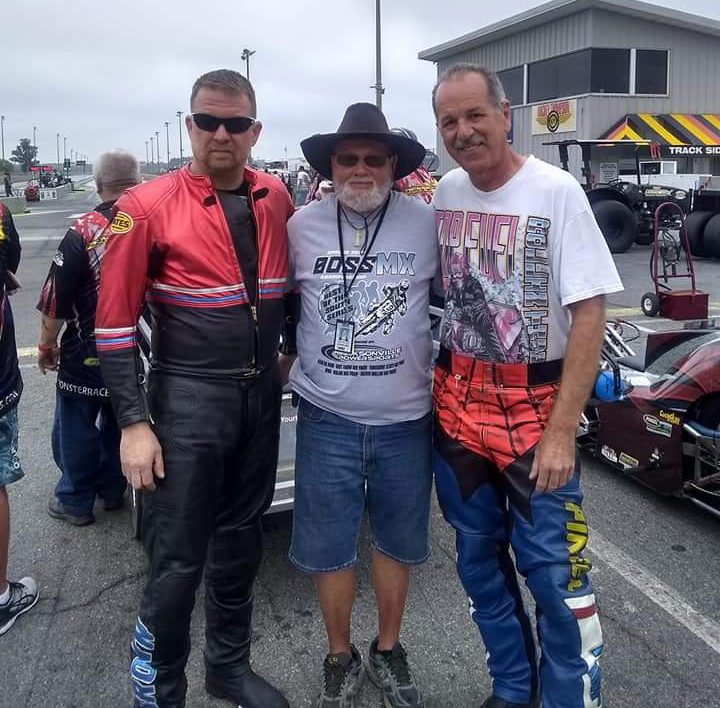 With Dave’s performance, we knew that even if we put our rental engine from Sam Wills in we would only have a chance to win if they had a major problem, so we elected to save the rental fee and rebuild fee and just run with our hurt engine. Team Vantine laid down their quickest and fastest pass to date against us in E2 with an Amazing 5.74 @ 254mph!!! 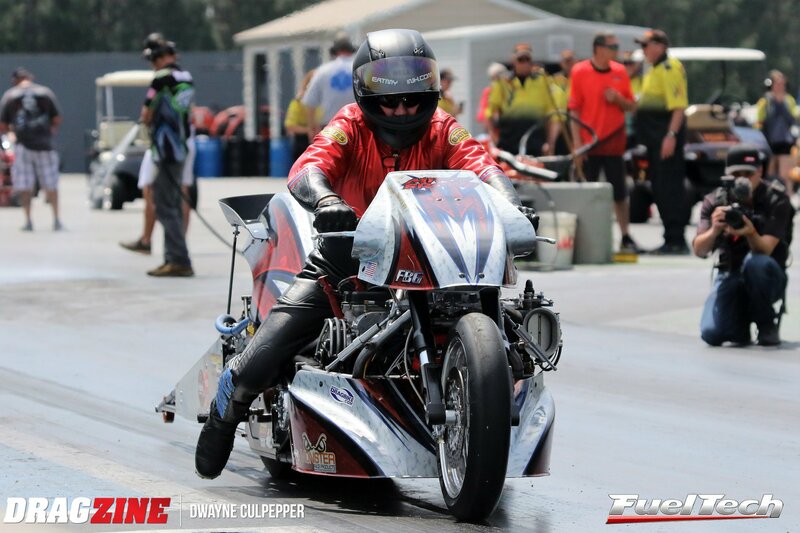 We had a better than expected run of 6.276 @ 212.06 letting off early after Dave had already crossed the finish line. As always we had a fun time at the track, learned a lot more, and enjoyed seeing our friends. 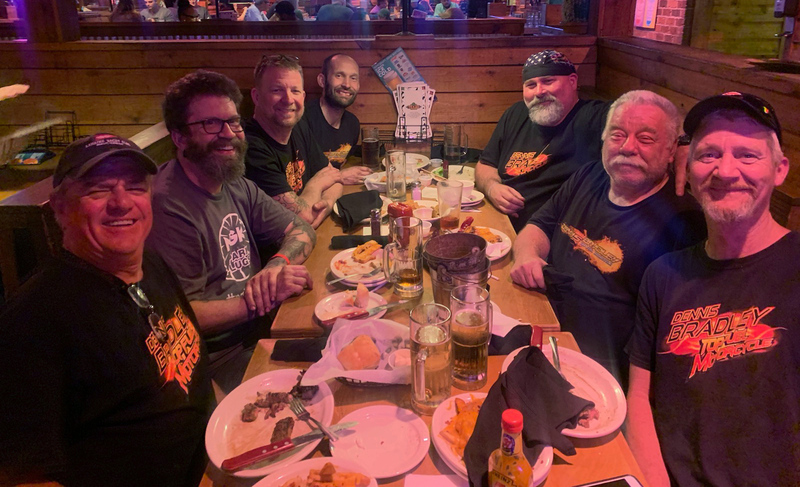 We want to give a special thanks to Dave Dunigan for the qualifying money in Top Fuel, we were able to eat at Texas Road House Sunday night instead of McDonald’s again! Click here for full race coverage from the event.